OTTAWA - Although the cost to build solar power has plummeted over the last decade, a new report suggests Canadians aren't rushing use the sun to make electricity. The National Energy Board has released its annual look at the state of renewable energy in Canada and it says solar energy accounts for just 0.5 per cent of all Canada's generated electricity. And almost all of that exists entirely in Ontario, the report notes. NEB chief economist Shelley Milutinovic said the trend in Canada is that renewable energy sources like wind and solar are replacing coal as Canada moves to eliminate that as a source of electricity by 2030. Between 2005 and 2016, non-hydroelectric renewables - wind, solar and biomass - grew from 1.5 per cent of total electricity generation in Canada to 7. During that same period coal fell from 16 per cent to 9.3 per cent as a source of power. Canada intends to eliminate coal as a source of power by 2030 and only four provinces still get any power from the fossil fuel. The Organization for Economic Co-operation and Development released a review of Canada's environmental policies this week which gave the country a rough ride for its energy-intensive, high-emitting, resource-based economy, but did point to Canada's electrical supply as a positive. Only about 20 per cent of Canada's electricity comes from fossil fuels now - divided almost equally between coal and natural gas. Nuclear energy accounts for 15 per cent of Canada's electricity supply. The rest comes from renewables. Hydro is the big beast in that, responsible for almost 60 per cent of Canada's power in 2016. While actual hydro power generation has grown about seven per cent in the last decade, other renewables are exploding. The amount of electricity generated by the wind is 20 times what it was in 2005, and wind as a percentage of total power grew from just 0.2 per cent in 2005 to 4.7 per cent in 2016. Solar didn't exist as a source of power for utility companies in Canada a decade ago. By 2016, solar capacity was 2,310 megawatts, almost all of it in Ontario. Outside of Ontario, solar installations are mostly quite small. The largest solar farm in western Canada is a two-megawatt one on the Green Acres Hutterite Colony east of Calgary. Milutinovic said the costs of solar and wind are now very comparable to other sources of power which are making them more and more attractive. The cost to install a solar panel is about one-tenth of what it was in 2000, at about 95 cents per watt, according to the International Energy Agency. Despite that, Canada is outmatched in solar on the international scene. While Canada's biggest solar farm is about 100 megawatts, India this year unleashed one 10 times as large. The Kunrool Ultra Mega Solar Park is the largest in the world with 1000 megawatts of installed capacity. India had just 17 megawatts of installed solar capacity in 2010. It now has 12,000 megawatts. 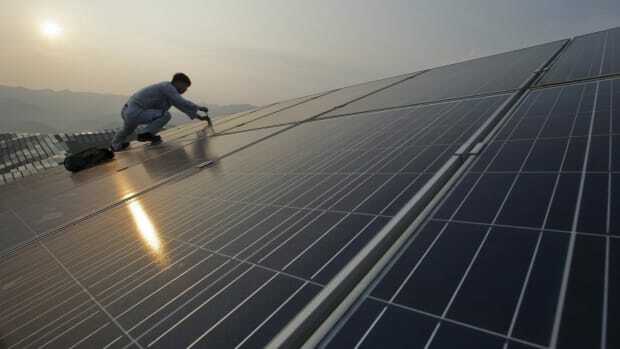 China is the world's solar leader, both in the manufacturing of solar panels and their installation. In 2005, China had 70 megawatts of installed solar power. In 2016,China had developed 78,000 MW. Canada is 13th in the world in the amount of installed solar capacity. Where Canada gets just 0.5 per cent of its power from solar, Italy gets 7.5 per cent, Germany gets 6.7 per cent, Japan 4.9 per cent, the United States 1.4 per cent and China 1.07 per cent. Milutinovic said the one thing not measured in this report however is the capacity for solar installations on private homes and businesses. She said some of the Ontario solar generation numbers include those, but elsewhere that is simply not being tracked. So there is no good data on how many individuals now have solar panels on their roofs or how many farms have them in their fields. She said it is one area governments should be looking at to get a better picture of what is actually happening on this front.